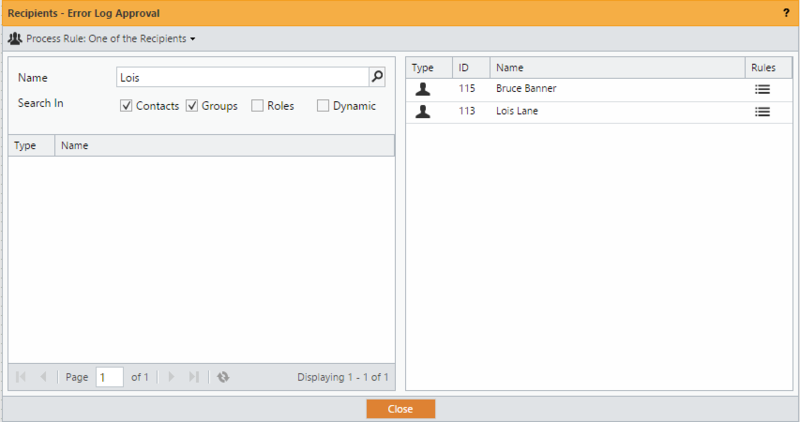 The Excel Batch Plugin can be used to launch requests based on the individual data rows within an Excel spreadsheet. 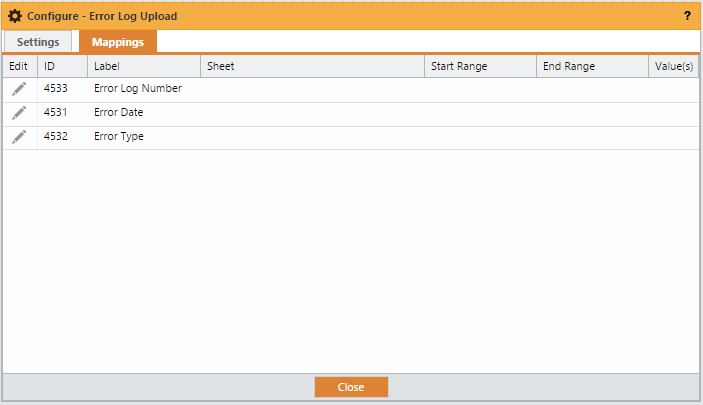 Note: When a process with the Excel Batch Plugin is launched the requester will be presented with a file attachment question. Name of launched request: Allows you to provide an alternative name for the launched requests. If left empty, the name of each new request will be the name of the process launched by the Excel Batch Plugin Task. 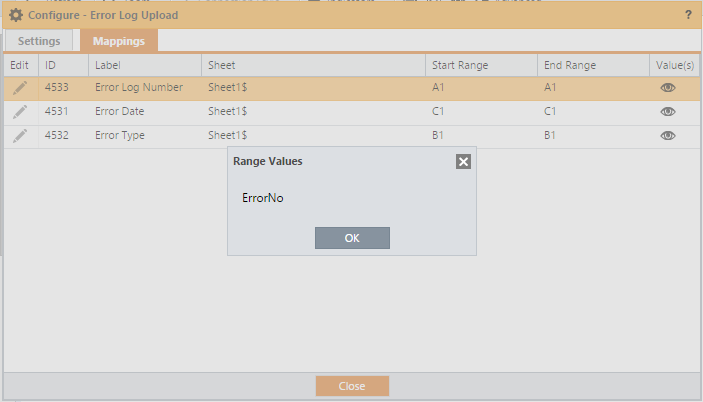 Start Range: This defines the first cell of the spreadsheet data range that you are mapping to the given question label on the form. For most Excel Batch processes, the start and stop range of any field will be the same. 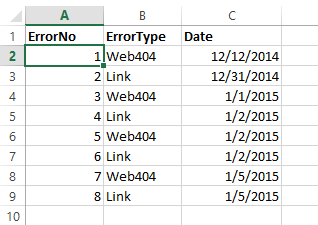 If more than one cell is is defined between the Start and End range, the question will be populated with a comma separated list of values from the spreadsheet. Review the training example below for further explanation. 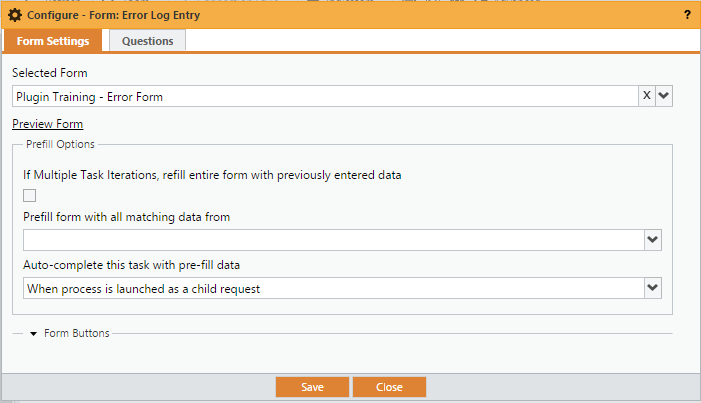 Note: Once you have configured the Excel Batch, you should review the 'Form Settings" tab of the form task configured as the "Form task in launched request to receive data" to determine if and how you want the form being populated to be completed. Specifically, you can set the task to auto-complete when it is triggered by the Excel Batch process. 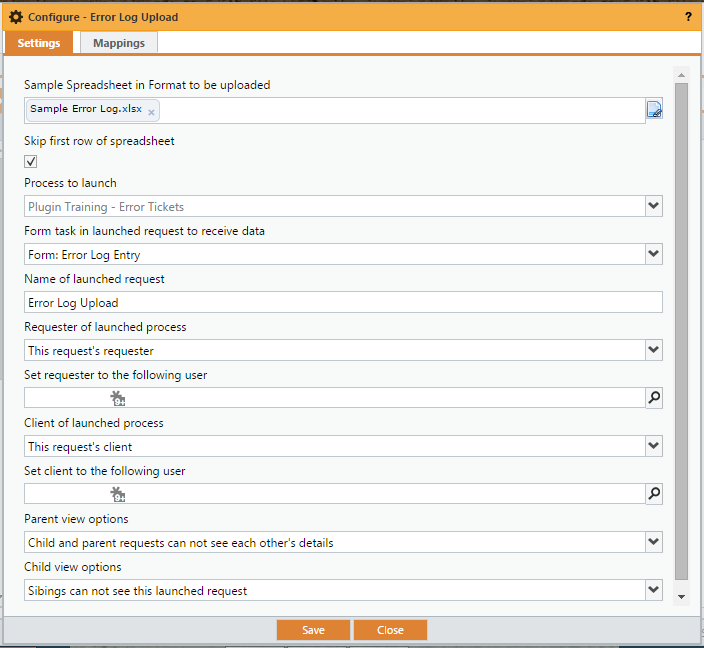 To do this, go to the Form Task for this process and select Configuration > Configure Task. 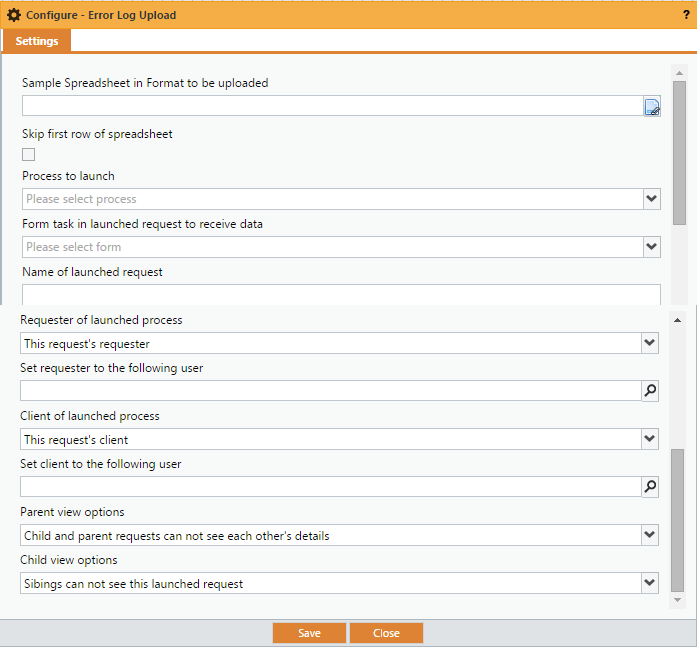 Select "When process is launched as a child process" from the field titled "Auto-Complete this task with pre-fill data". 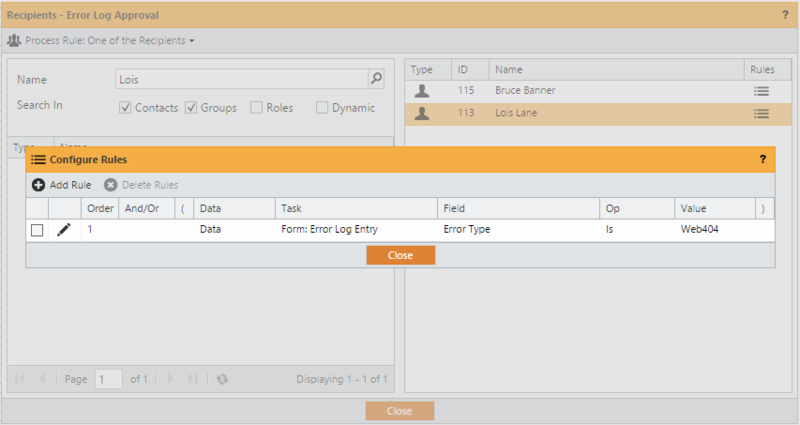 You can see that the Sample Error Log Spreadsheet has been uploaded and we have configured the process that we want launched, as well as the form task within the process that will receive each row of data. In addition, because my spreadsheet has a header row in it, I've selected to skip the first row of results. I configure each question that I want prefilled - even though I want the system to skip the first line of my spreadsheet, I still use A1 as my start and end ranges. This states that I want one row's worth of data from column A.
I then add a rule for each that uses Data as the Source. In this case I select the form that the excel data will be mapped to and choose "Error Type" as my field and Enter "Web404" as the Value. In other words, this will now route all Web404 error types that are created as a result of the Excel Batch process to Lois Lane. Click "Close" to complete the rules and again to exit the Recipient screen.